OPEN MIND Technologies AG has now released the latest version of its CAM system, hyperMILL® 2017.1. 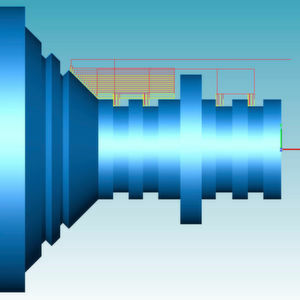 Users now benefit from many new functions and optimisation tools that make programming faster while reducing auxiliary processing times when carrying out machining jobs. The software developer has also made crucial additions to hyperCAD®-S, its proprietary CAD for CAM solution. Manufacturing companies heavily rely on multi-functional mill/turning centres to optimise their machining processes. OPEN MIND supports this trend and has added many new mill/turning functions to hyperMILL® 2017.1. The extended chip break function for turning operations now allows the customer to machine hard and soft materials with more flexibility than ever before. New functions make it possible to remove chips safely for non-falling contours. The machining length can now be defined in combination with a short stop to break swarf. This ensures the workpiece is not damaged by swarf getting wrapped around the spindle. It’s also possible to maintain high surface quality with the machining length defined in combination with a short pause. The user can select from two methods to specify the stop, define the dwell time or even the number of spindle rotations. Greater control of the chip break is now possible where the area to be machined is divided into multiple sections that are then machined in a specified order. The new release offers a number of new functions and expansions for 2.5D and 3D machining. hyperMILL® 2017.1 supports cutter radius compensation when using 2D thread milling and 2D helical drilling strategies. If the tool radius changes, hyperMILL® automatically adjusts the programmed path. The user has two options for how this adjustment is made: the compensated path option or the compensated centre path option. The new 3D cutting edge machining strategy is one of the highlights for 3D milling jobs. This strategy enables efficient machining, particularly for cutting blades, which are frequently used in tool engineering. Roughing and finishing operations can easily be generated via a 3D curve selection. The rest material machining is generated via the ‘Reference job’ option. Here, the rest material areas of the previous machining operation are also included in each case. Toolpath smoothing ensures a better milling result if the contours are of poor quality. The new version also expands the scope of the hyperMILL® MAXX Machining performance package. hyperMILL® 2017.1 allows the spindle speed to be adjusted in the plunge macro for roughing. Modifying the spindle speed and specifying a dwell time for the speed change ensure more tool-friendly machining. This option also increases process reliability. Users can now benefit from two new functions for 5-axis swarf cutting with a curve. The perfect surface and equally perfect curve are created automatically for SWARF cutting based on a simple face selection. This feature automatically fillets interior corners, so the programmer can eliminate the input of additional geometries when pocket and fillet machining. Three basic improvements make the newest version of the hyperCAD®-S CAD solution stand out. This is the draft, curvature and selection function analyses. The new selection functions make selecting CAD elements particularly convenient. The new draft and curvature analyses help users quickly view and examine milling areas or radii sizes.